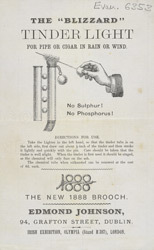 The Blizzard Tinder Light was manufactured by Edmond Johnson and was first exhibited at the Irish exhibition at Olympia in 1888. Such exhibitions had become steadily more popular after the success of the Great Exhibition in Hyde Park in 1851. The Olympia was build in the early 1800s and had a huge glass vaulted dome for a ceiling, some 100 feet above the floor.